Arrange your seating plan in just minutes! 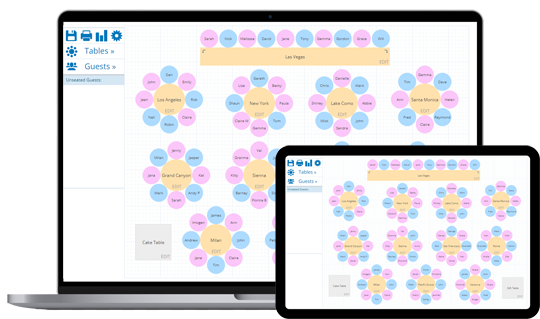 Simply drag and drop your guests and tables to create the perfect plan. So simple to use - plan your seating quickly and easily. Arrange your guests on PC, Mac, iPad and smartphone. Print plans or email them to your venue and suppliers. No software to download - it's all done online. Try it risk-free today with our 7 day money back guarantee. Free email support from our friendly team. "We use it for the Wedding Ideas Awards every year." "The top 75 best wedding websites"
"It's so easy, an 11 year old could do it." "10 amazing apps to simplify wedding planning."